Our plum coloured Brickcrete concrete precast walls are manufactured using a darker plum color oxide that blends in with darker brickwork or plastered finish. Our Brickcrete precast concrete walls comes in 4 different colours namely tan, multi, plum and beige. All brickcrete precast concrete walls have the same aesthetic quality of a solid brick wall at a much lower price. No bad side. Bi-sided brick finish makes it acceptable to both neighbours if erected between two erfs. Oxide is mixed into the cement so no painting is required. Call us or do an online enquiry, we service the Whole of Gauteng and its surrounding areas. 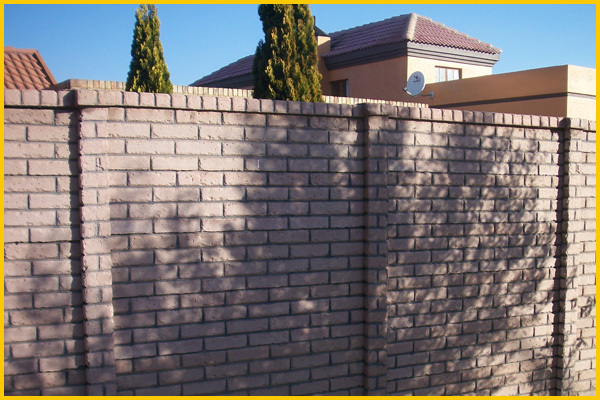 We also do extensions on existing walls as well as repair all types of pre-cast walls.